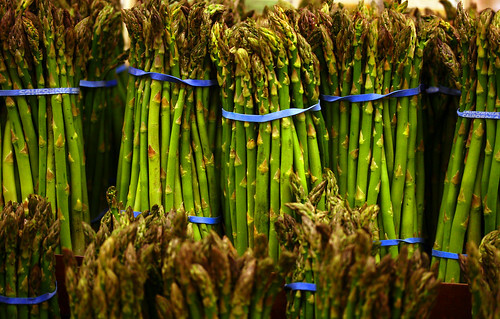 Soon we will be seeing asparagus at the farmers markets and more prominently in stores. Today I’d like to share a few tidbits about asparagus. Asparagus is a great source of Foliate. One 1/2 cup serving contains 34% of your daily requirement. Asparagus helps digestive health with the carbohydrate inulin and 7% of your daily requirement of fiber. Asparagus is a member of the lily family, and are related to onions, garlic and leeks. Boil asparagus for 5-8 minutes for a tender veggie. To maintain freshness, store clean asparagus for up to 3 days in the refrigerator with the bottom wrapped in a damp paper towel. When purchasing, choose firm, straight stems. Look for tightly-closed tips. Are you a fan of asparagus? How do you prepare it? Return tomorrow for a recipe for Lemon Asparagus and Mushroom Pasta. My favorite way to prepare asparagus is to line it up on a baking sheet, drizzle with extra virgin olive oil, and sprinkle sea salt, black pepper and garlic powder on top. Bake for about 10-15 minutes. Yum! That sounds delish! I’ll have to try it. Last night I threw it on the grill.